Card Review: Impact Dragons Unleashed! What’s up guys, it’s February here (it’s actually April) and I’m back to present you another card review! 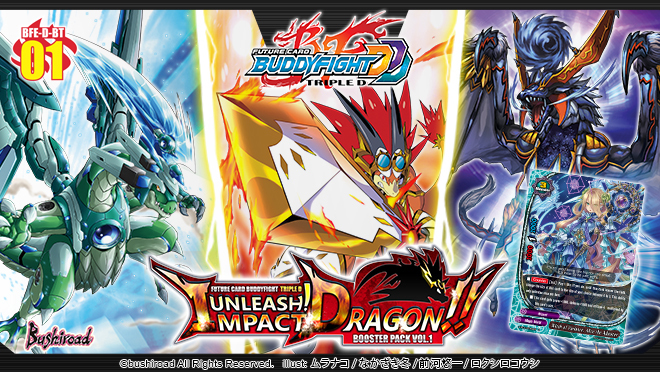 Today, we’ll be featuring the new RRRs from Triple D Booster Pack Vol.1 “Unleash! Impact Dragon!!”. First up, the Dragon World! Let’s go into these brand-new 《Sun Dragon》 cards! Get ready, bal! A relatively cheap size 3 monster with pretty good stats! 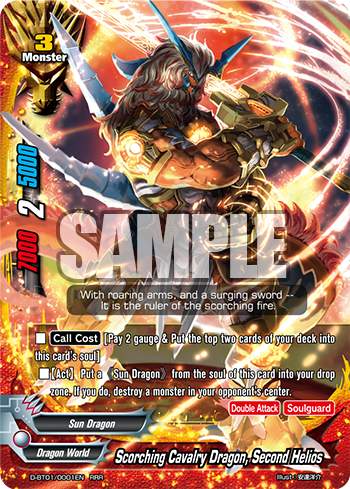 “Scorching Cavalry Dragon, Second Helios” can either take down the field with its moderately high power, or sacrifice its defense and destroy monsters during your own turn to tackle more powerful enemies. Having cards put into the soul as a [Call Cost] also prevents spells from prematurely destroying Helios, and will allow for a pretty decent defense. 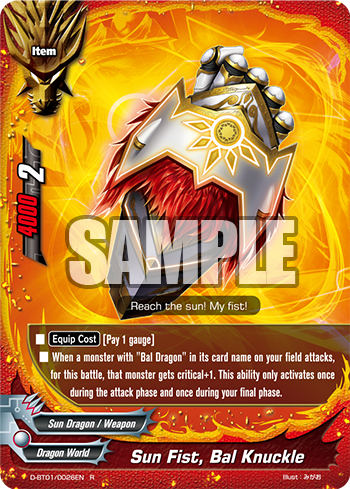 The flexibility of this card to either be played offensively or defensively makes it a good card to put in any Sun Dragon deck. 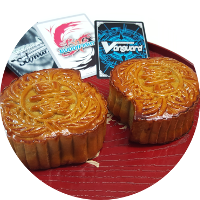 However, do note that you can only put 《Sun Dragon》 cards from your soul to use the second ability. Also, it might be tricky to balance the deck considering many powerful Dragon World spells and monsters are not of that attribute. 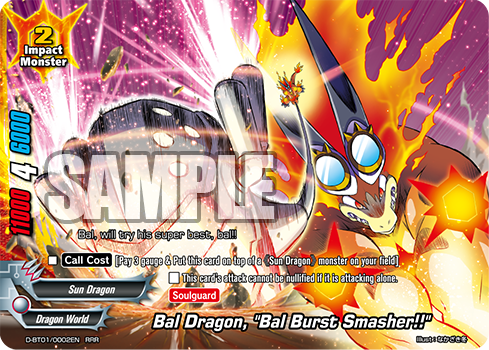 A hugeeee monster in terms of stats, “Bal Dragon, “Bal Burst Smasher! !”” is a giant as large as his sledge hammer (I think that’s what it looks like…?). With this card’s sky-high critical value of 4, you can deal a huge blow and change the tide of the game! What’s more, this attack cannot be nullified! 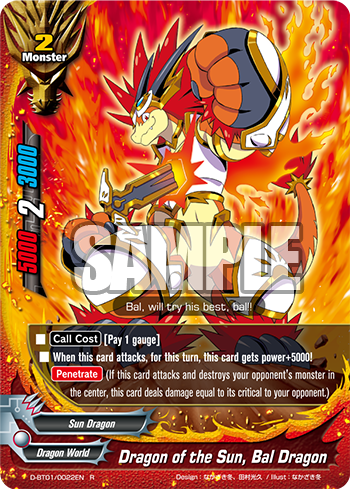 Together with his normal monster form “Dragon of the Sun, Bal Dragon” and “Sun Fist, Bal Knuckle”, you can even swiftly end the game with a quick 10 damage within a single turn!! Bal, try your super best, bal! Next up, the spell-binding Magic World! We haven’t seen Asmodai back in the story, but he is already here as cards in this release! 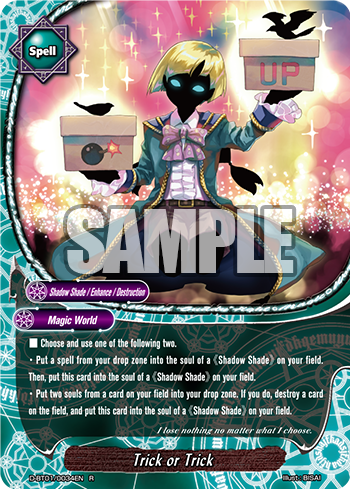 “Manipulator of Shadow, Silhouette Terry” is a pretty useful card in the brand-new 《Shadow Shade》 themed deck. 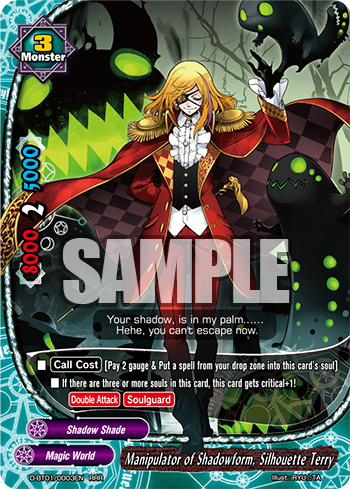 With spells like “Trick or Trick” and many new effects that can put 《Shadow Shade》 cards into this Terry’s soul, it’s not very hard to fulfil its second ability. Toy with your opponents and end the game with a 3 critical [Double Attack]!! 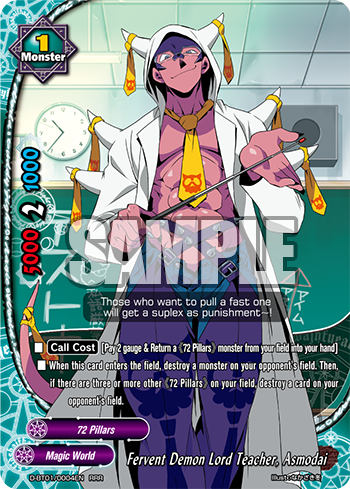 With a potential to destroy two cards on your opponent’s field, “Fervent Demon Lord Teacher, Asmodai” is a card that can recycle useful cards, or even himself by returning them into your hand by its [Call Cost]. With its decent stats, you can likely take down an opponent monster as well to clear the path for other monsters. It’s a great card to combo with – especially with “Great Spell, Saturday Night Devil Fever”- ensuring that you will dance your way to victory. Did you know that the names of the Black Dragons of Darkness Dragon World are mostly inspired from metal bands? Now you do! Moving on! A pretty huge monster for a rather low cost, “Black-eye Demonic Dragon, Blagg Za Bath” works well with other monsters with similar abilities. 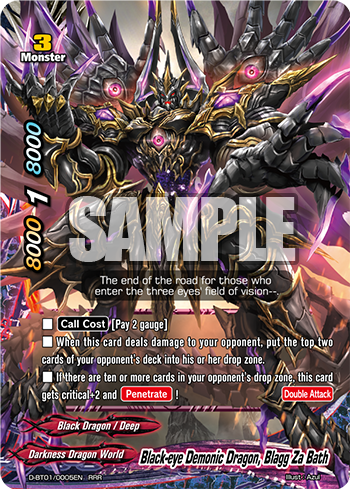 By directly dealing the opponent damage twice and putting 4 cards from your opponent’s deck into his or her drop zone, Blagg Za Bath can either activate the abilities of other monsters, or fulfill its own ability requirements. This puts severe pressure on your opponent to remove this monster as soon as possible, as it threatens to destroy cards on their field, and even cause them to slowly run out of cards in the deck! 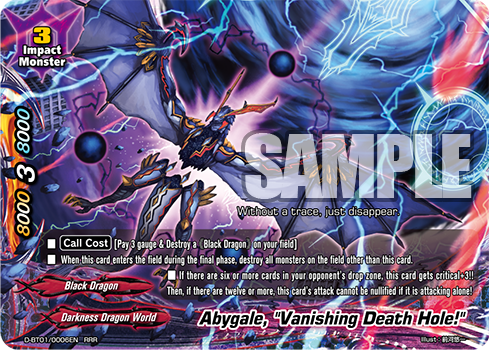 A very high cost monster, “Abygale, “Vanishing Black Hole!” is a beast that destroys everything in its path! By using abilities that either puts cards into your opponent’s drop zone, or by destroying monsters on your opponent’s field, you can fulfill the second ability of Abygale and deal an incredible 6 damage to your opponent that cannot be nullified! Since all monsters are destroyed, there is only a need to reduce the opponent’s monster to 0 soul before playing this card, rendering [Penetrate] irrelevant to the victory that is at hand! Into the stars! The new Star Dragon World will allow you to make new combinations with brand new futuristic weapons and Dragonarms! A low cost size 3 that can be buffed up with a variety of Dragonarms, “The Over EX, Dimenzion” is another flexible card that can have extremely prolonged longevity with its [Call Cost]. Being able to gain [Penetrate] or [Double Attack] to suit your needs, you are able to plan your attack efficiently depending on the cards in its soul. In fact, you can use the ability twice to gain both keyword abilities! 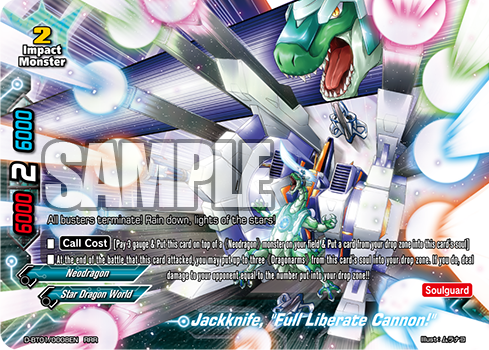 A rather costly card to play, “Jackknife, Full Liberate Cannon!”” is worth every gauge spent for its abilities! 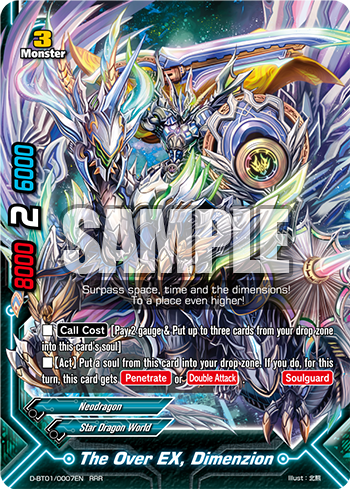 By playing it on top of an existing 《Neodragon》 on your field, it can dish out some heavy punishment with Star Dragon World’s wide range of Dragonarms such as “Dragonarms, Radiant Alma”, “Dragonarms, Cavalier” or “Dragonarms, Elgar Cannon” in its soul! Then, put them all into your drop zone to fire off another round of damage!! That concludes our review of the RRRs of D-BT01 “Unleash! Impact Dragon!!”! I hope you will be able to encounter some of these powerful cards when opening your packs! How will they play out in the story of Future Card Buddyfight Triple D animation? Just wait and see! It’s gonna be a blast, bal! Let us know what you think about these new cards and how you plan to include them into your decks! Until next time!